About: The Smithfield Tavern now has a vegetarian menu with some vegan dishes. "A charming, traditional pub hidden away in Farringdon"
Farringdon is a strange sort of place. In many ways it’s all about the history and the architecture but then there are the hip restaurants, clubs and all night bars that inhabit it. The Smithfield Tavern, like the eponymous market, belongs on the historical side. Tucked up a quiet street it hides in plain sight, surrounded by City bars where loosened ties pass for casual. The family run, independent pub has stood here since 1872 and if you remember it by another name then that’s probably because it only reverted to the original Smithfield Tavern title back in 2008. Spacious enough to accommodate large groups, yet intimate enough to feel cosy, the Smithfield Tavern is a welcome touch of tradition in Farringdon. Once this area was filled with old boozers and it’s a pleasant sight to see a venue retain its character and charm. The tradition doesn’t end with the building and its interior, it extends to the food. Expect the usual burger, sausage and mash and pies to dominate the classic menu; all reasonably priced at around £8.00. The lager on tap sticks to some usual well-known brands like Becks Vier but there is a good selection of ales including St. Peter’s Best. Although it may be a classic pub, it can get lively just as well as the rest of Farringdon when it wants to. 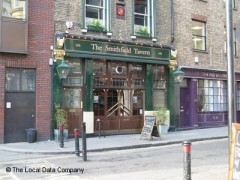 Weekends are traditionally quiet in this part of town and that goes for the Smithfield Tavern too. But the pub employs a DJ for a big Thursday night pre-weekend starter of funk, soul and all those other genres you can dance to without feeling as if you need to know the songs. While we wouldn’t perhaps go out of our way for a trip here it is a lovely pub that is well worth a visit should you be in the vicinity – especially on a quiet Saturday night.